Write or do? That’s a question I’ve been tossing around in my head for a while. On Friday, sitting with three blogger friends (and having a great time), I listened with interest to them discussing their WIPs. It was wonderful to hear how they are attempting to piece their novels together. But I declared to them that I had given up on writing a book. My argument was that there are too many books out there. I’ve always wanted to have at least one book published. Somewhere down the line, I lost interest and decided to focus only on my blogs. Then last year, I began to work part time for Divya Disha and slowly see myself being drawn into working full time, for a while at least. I’m not sure if it is the experiences of the last few months – loss of many kinds, that has led me to want invest more time in building living legacies. What do I mean by that? I’d rather invest of my time and skills in people than in words. Please don’t get me wrong. Our writing can and does make a difference. But perhaps at this particular stage in life, I’m looking at more visible signs of making a difference? Am I making sense to you? I’m barely making sense to myself. But then that’s what musings are all about, aren’t they? 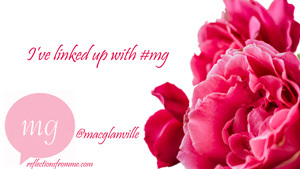 Also joining in with Mac for the #mg linky. You make a good point, you don’t have to write a book just to be a published author. But please, don’t think there are already too many books. There are. But how many good books are out there? What if the writer in you can churn out stories that no one has ever told and that need to be told? I sit on the cusp of this decision often, and I guess I’ve concluded that the answer (for me) is write AND do. I don’t write nearly as much or as well as I”d like, and I certainly don’t do everything I want to do (never mind all the things I should do . . .), but I’m finding that one informs the other. I write better when there are people in my life who need me and I am more available to them when I’m writing and studying regularly. Blessings to you as you also turn this question over in your mind and heart. Well said, Corinne. Go by your heart. It won’t cheat you. Wise decision on investing time ed on people. After all we will live here only for a short period. Let us make that short period as years of happiness in people’s heart. You can come to your writing as and when needed for your heart. Until then stay loved, dear. Go with your gut feeling, Corinne and let things take its’ own course. I feel exactly the same at this point in time and my heart says that writing is fine but what I DO gives me much more satisfaction at the end of the day, so I’d go with the latter if i had to choose between ‘writing’ and ‘doing’. I believe our heart has all the answers for us. If it prods one to seek satisfaction in writing (a book or not), then it must do that and if it points into some other direction, then may that be the doing. Do what you feel like doing; the heart will want what it wants. If its guiding you towards building living legacies, then thats what you do. Its a lovely idea to invest time and self into people; giving of yourself is the toughest thing to do and if your heart is motivating you in that direction – Onward march and Tally Ho my friend!!!! !